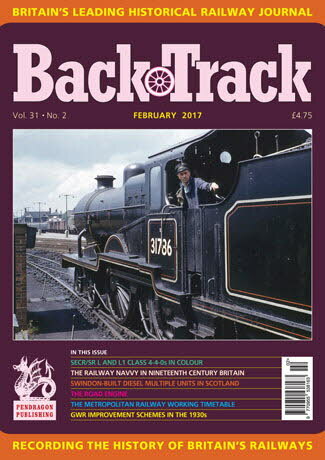 Railway Magazine | BackTrack February 2017 journal from Pendragon Publishing. Beyond Euston - four pages of colour by David Idle before electrification transformed the route. The Road Engine - Alistair F. Nisbet writes about the Dundee harbour lines and others which ran through public roadsides. The Railway Navvy in Nineteenth Century Britain - Federico Tak reflects on the hard lives of railway builders. Dispute over Running Powers - Bill Taylor describes a legal argument between the Midland and Great Central in Nottinghamshire. By Steam to the Steamers - Part Two of Malcolm Rivett's history of train services to serve the Isle of Man sailings. Eric Bruton's A3 Pacifics - three pages of archive photos on the East Coast Main Line in the 1950s. The SECR and SR L and L1 Classes - three pages of colour. Swindon-built Diesel Multiple Units in Scotland - a review by Allan Trotter. A Wednesbury Winter's Night - Part Two - David J. Hayes concludes his account of work at Wednesbury No.1 signal box in December 1976. Namings and Centenaries - A review of four examples of British Railways paperwork by Chris Fox. More Great Western Railway Improvement Schemes - Jeffrey Wells describes 1930s schemes at Cardiff General, Didcot, Swindon and on the Birmingham main line. Pick a Colour - some post-privatisation locomotive liveries photographed by Paul Aitken. The Metropolitan Railway Appendix to the Working Timetable August 1921 - David Wadley notes some unusual extracts.